Over the last few weeks, Maybelline has quietly released the coloured versions of their baby lips in Australia. I picked up 2 from Chemist Warehouse without realising that there were in fact 4 new shades but I managed to find the other 2 shades at my local Priceline. They're priced similarly to the normal baby lips which are normally $3.95 each. I haven't seen any reviews of these yet so I thought that I'd do a quick one for people who might be interested in picking up some of them. 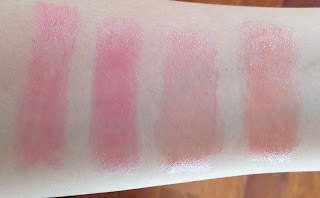 I love them to bits so I do recommend them but I hope you'll find my swatches useful as I know I was surprised by the colours and the pigmentation that they gave off (they're super sheer!). I found them to be a little more buttery than the normal baby lips. They were more likely to melt if I pressed down too hard but they are so moisturising! The range consists of 4 colours which are between light pink to red. In the tube, they all look pretty similar in colour. All of them are really gorgeous colours though and apply in different colours to my lips. I didn't do any lip swatches as I think that they would probably look different on everyones lips depending on how pigmented your natural lips are. The wear time on these is about 1.5 hours before the colour fades but my lips stayed moisturised for another good hour or so. The swatches on my arm will show that they're only slightly tinted which I love as they're really good for work (my workplace is really casual). If you want to look like you've made an effort but don't want to put a lipstick or lip gloss on, wear one of these and you'll still look polished as they make your lips look really glossy. 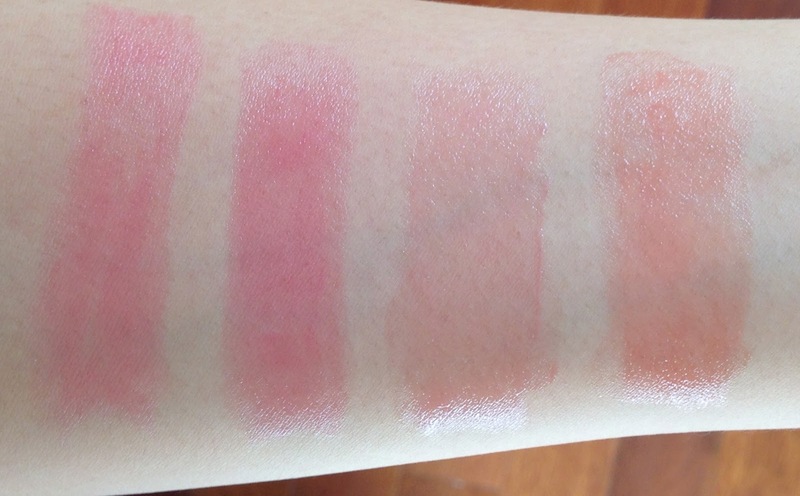 You can tell that they're really sheer as each swatch was about 7-8 layers of the lip balm. They might look sheer but they look amazing on the lips! All of them could give you a "my lips but better" look. These are amongst my favourite lip balms ever! 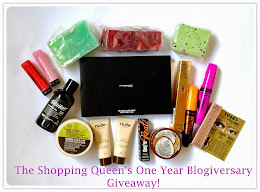 Don't forget to check out my YSL glossy stains post from this morning :) You can check it out here. Thank you so much for this post! I have been searching everywhere for this without any luck. I didn't realise there were that many shades, I thought there were just two. I am so pleased that Australia finally has some tinted ones, because I love the Baby lips balms but have been desperate for tinted ones! My Priceline is selling out fast! They were hidden behind the new Maybelline BB creams at both Chemist Warehouse and at Priceline. It's so easy to miss them! Seriously? Australia's normally the one who misses out on everything. This is my favorite lip balm on natural makeup days! These look great. I plan on getting them! These seem worth a try, I've never used any Maybelline Baby Lips products before because a lot of them have SPF included and I am pretty sure that I'm allergic to lip balms that have SPF in them, sadly. But thanks for this review! Thanks for the review! I wasn't sure about these, but I'll probably end up getting at least one... My current babylips keeps getting lost so it'd be good to have a spare! I think you only really need one... all of them are pretty similar on the lips. Definitely going to try a few of these. I already use the clear Baby Lips, but I'm glad to hear these are a little softer. They're just a tad softer but still a good consistency. Here in the Philippines we got some baby lips but we're pretty tinted in a bit. I mean some says its clear but it has a little tint. I havent heard about these baby lips! And will definitely try it as soon as we have it already here in my country. Anyway those are pretty cheap but here in my country they are cheaper I mean less than 2$ <3 Such a steal right?